Invited By Obama To 'Pop Off,' John McCain Just Did : The Two-Way In an interview with Morning Edition, the Republican senator criticized the administration's strategy against ISIS, following the president's remarks Monday. Republican Sen. John McCain critiqued President Obama's strategy against ISIS today, casting doubt on claims that a political settlement may be near in Syria. He also responded to Obama, who yesterday challenged critics of his administration's strategy. "If folks want to pop off and have opinions about what they think they would do, present a specific plan," the president said, sparking an Internet sensation. Morning Edition played the president's remark to McCain, who has been one of the administration's leading critics. "You want to pop off?" I asked him. 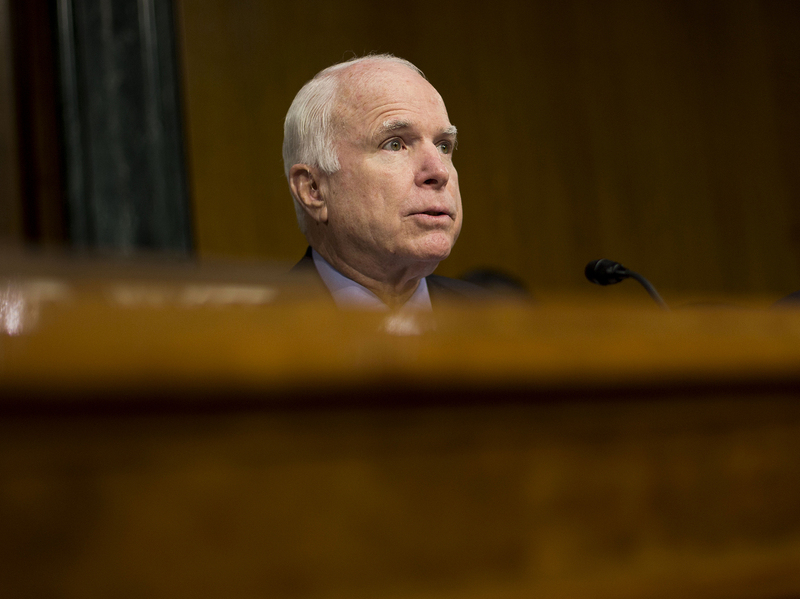 "This is the kind of thing that's so disappointing about a president of the United States," McCain said. "He has to resort to this kind of rhetoric. But second of all, he is basically saying that he has a strategy that's working. No one accepts that." Of the president's reluctance to send U.S. ground troops, McCain said: "You can fight them there, or you can fight them here. That's your choice now. That's your choice. And obviously the president wants to fight them here." McCain insisted that he still favors a much more intensive on-the-ground role for the U.S. military, helping rebels to establish "safe zones." He insisted, though, that he would stop short of a full-scale invasion, and that it was unfair of Obama to suggest otherwise. McCain was equally scathing about the prospect of a peace deal in Syria. Secretary of State John Kerry said Tuesday that a "big transition" is "weeks away" in Syria. He said that at recent talks on Syria, all involved nations agreed on a cease-fire, including Russia and Iran, the allies of President Bashar Assad. "Transition" is the common euphemism for easing out Assad in favor of a government that more moderate rebels can live with. The United States hopes such a transition will pave the way for all anti-extremist forces to join in battle against the Islamic State. McCain warned, however, that a transition acceptable to Russia was far more likely to leave Assad in power, while freezing out the Free Syrian Army and other rebel groups that McCain has publicly supported.